Can you please check whether get_prop(198) returns the zoom value you set previously with set_zoom() ? Here's a distortion test for SX150IS (has physical aperture) completed using chdkptp. why the focus distance difference (can a small change in ambient light account for such a change by autofocus)? significance of the get_prop(198) return value? How do you load the bcamHost.lua? I don't understand how to run it on the PC, I've successfully run the bcamRem.lua on the camera by loading it via card reader to the card and run it with "Load Script from File..."
Single pole relays would be worse. One other note - you probably what to use the N.C. terminals on your relays so that when you press the bottom the contact opens to disconnect the 5V to the cameras. and I encounter the same problem of my camera shooting before receiving I disconnect the 5v power. I tried what he did (wire the power into relay) but the camera still shoot even before I disconnect the power. Does this have something to do with the custom CHDK firmware you made for him? If so can you upload it again? I can't download it because the download link have expired. It would be helpful if you can describe you what you actually did, and how the result differed from what you expected. Saying you everything the same as something someone did 5 years ago in a 20+ page thread doesn't make it easy to spot what the relevant differences would be. If you followed steps described in a specific post, linking directly to it would be help. In general, you should not need a custom build to use USB remote and PTP together anymore, although it's possible one was needed 5 years ago or that some details have changed in that time. To expand on this @reyalp comment, it would be even more helpful if you'd tell us the goal of your project? OK so hopefully the attached flowchart can explain my goal. I want to make the cameras connect to PC, shoot at virtually the same time, and then download the pictures into folders. Your latest codes (bcam1-4.zip) link did exactly all of that except waiting for the 5v power to drop(red arrow on flowchart). I've replicated everything OP did but still can't get it working. The only thing I haven't tried is using custom FW you made(scattered on several posts on this thread) but I can't because all the box links expired. Thanks - that much better explanation of what you are doing really helps. Before I dig further into this, as I reread that thread, I think that the solution to the camera shooting too soon was for the OP to set the Use Remote Sync ? [ * ] script parameter option. (i.e. not the Enable Sync option in the Remote Parameters menu). Do you have it enabled? I think that was something different. 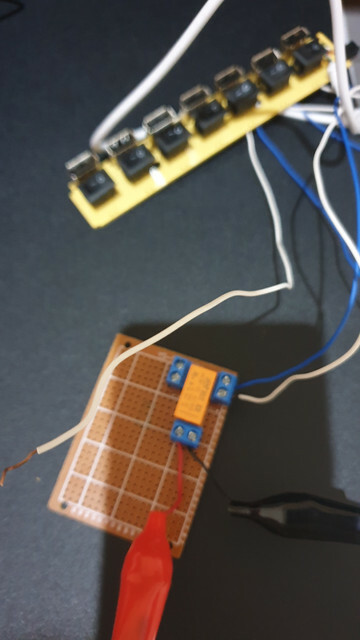 He added the relays so that he could drop power to the +5V USB pin and initiate the "shoot" without losing the USB connection on the D+ / D- pins like he would if he simply removed power from the USB hubs. So it sounds like you are having problems with remote generally. First question: Which camera model? A2500 ? If it passes, then a good next step is to use a single camera with your software/script setup, but with manual control of the +5v. You can just use a regular USB cable and plug/unplug to check that shot starts at the right point, but beware the camera and PC USB stacks may get confused after that. If you wire a simple switch on the +5v line of a USB cable, you should be able to do full test. Page created in 0.256 seconds with 31 queries.